Mr Tesco, Mr Sainsbury, Mr Waitrose. NO! Mr Kumar is the best! | "MASTERS"
Mr Tesco, Mr Sainsbury, Mr Waitrose. NO! Mr Kumar is the best! Posted on September 16, 2015 by Mark and Sarah - MASTERS! Sarah: We are still married and still talking! And on the 17th September (tomorrow) we celebrate 27 years of marriage – who’d a thought it??? I have to admit that two weeks into our little trip, I am still enjoying the experience. Mark typically only gets on my nerves three times a day, which is better than the half a dozen I thought he would…. That’ll change I’m sure. One of the joys of travel I’ve found, is the fact that you don’t have to worry about food shopping. However, navigating menus in local restaurants with sign language can occasionally provide unusual and unexpected results! Our shopping experiences so far have been very interesting. 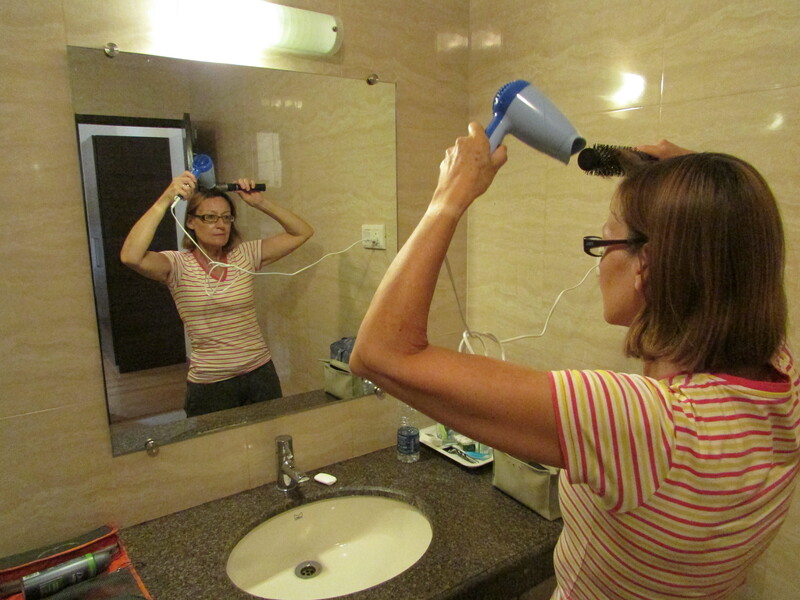 I needed a hair dryer – I thought I wouldn’t but I did. The kind of hotels we are staying in do not come with such things as “standard.” Having asked a few people where we might buy such an item, we were directed to a very nice hairdressers… I had to explain that no, I didn’t want my hair washed and styled just wanted to purchase a hair dryer. We did eventually strike lucky after much searching, thanks largely to Mr Kumar’s fantastic shop. Unlike the UK, there are very few chain brands along the high street. India quite literally is a nation of independent shopkeepers, a bit like England was 50 years ago. And when you step inside, each shop is like entering a time warp with products and goods racked high to the ceiling in a “higgledy-piggledy” fashion. Ordered chaos, but within seconds the shop assistants can find exactly what you ask for. I explained I wanted a hairdryer. The bemused look from Mr Kumar, clearly told me he hadn’t a clue what I wanted. 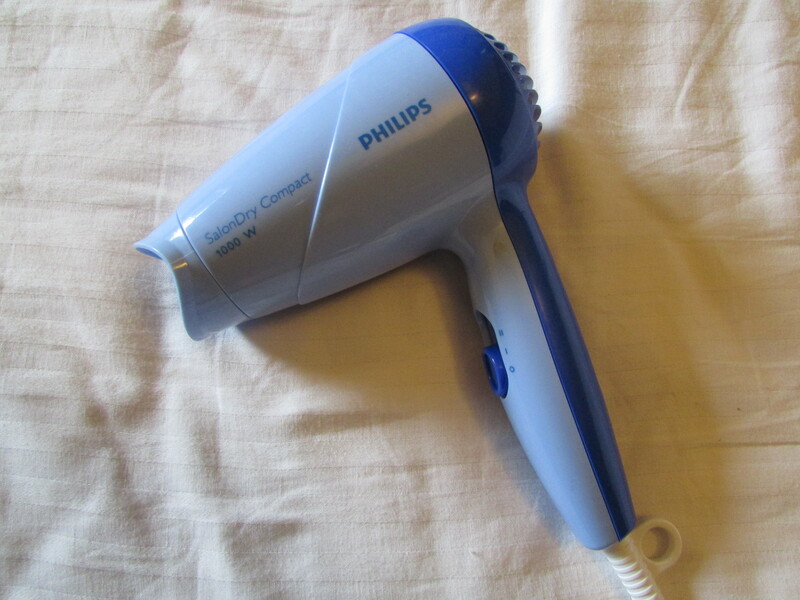 But with me then pretending to “blow dry” my hair very enthusiastically, he immediately ran to the other side of the shop, climbed a ladder and proceeded to bring me back a 1990s blue plastic Philips hair dryer. He took it out of the box, handed it to a colleague who then plugged it in to what looked like a four-gang extension cable. The dryer burst into life. With two speed settings, it was a bargain at 800 INR (£8 – Steve Elliott, exchange rate is correct as at 16/9/2015 @ 1227. Mark made me point this out Steve…) and so the deal was done. Then a third man got involved. His job was to give me a guarantee – really useful that as we won’t be going back to Shimla any time soon – he then carefully wrapped my purchase in brown paper with a piece of string. Proudly, man three handed the package to man four who was the cashier at the till. He took my money and presented me with a beautifully handwritten receipt. Finally Mr Kumar came back and handed over my purchase and bid us a “happy holiday”. What great service and so much more personal than a trip to Curry’s at Farnborough Gate! But four people to sell a hair dryer? Yep, that’s India for you. Food and “every day” items are just as much fun to buy as electrical goods. 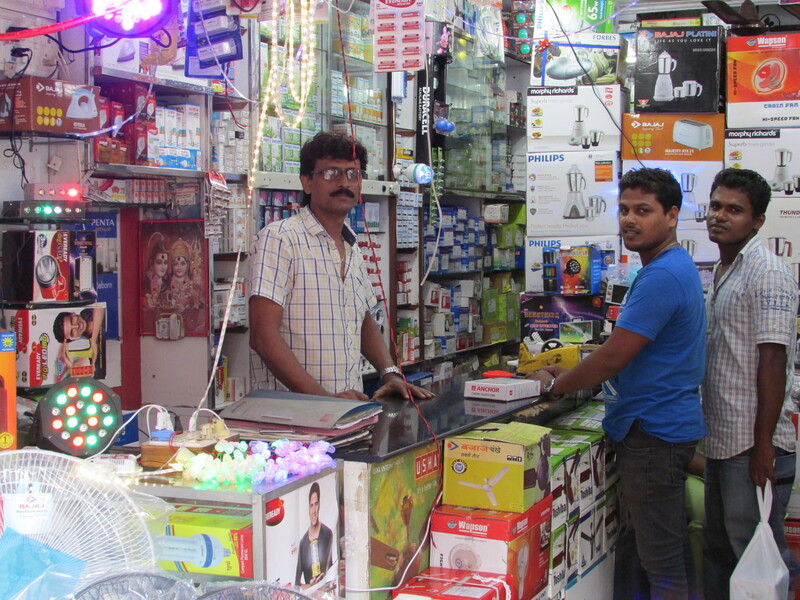 Bring on “Noel” the manager of Magsons – Hopping off Shopping on – in Panaji, the State capital of Goa. 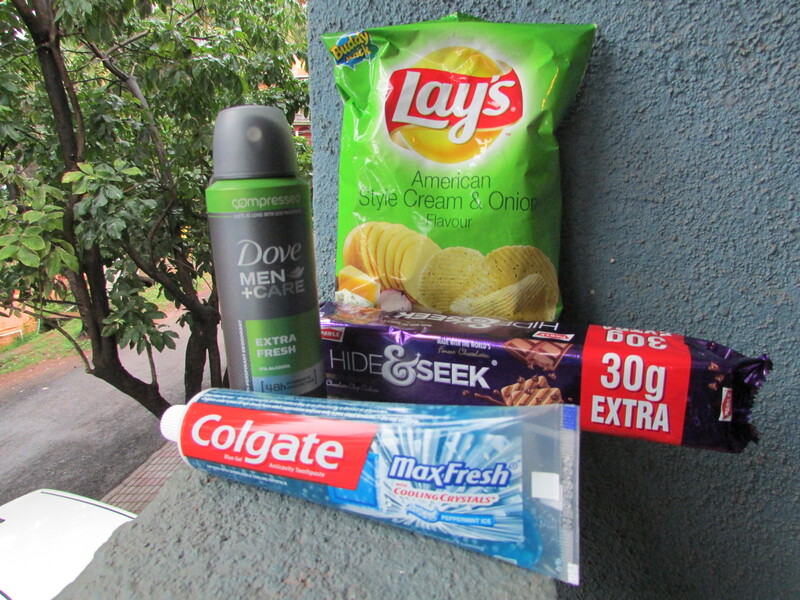 We needed some all-important shopping essentials, such as deodorant, toothpaste, biscuits and crisps! At the shop door, Noel – born in December – asked us to leave our bag with the store’s security man, before personally showing us his little off licence (Champagne @ £65!) When I explained we only wanted a few items he was equally helpful and after spending 275 INR (£2.75) we headed off with the promise we would return one day and Mark would watch a Test Match at Lords with him! Yes, I can recommend shopping in India – anybody want to open a Kumar franchise next May?